The software version of the System-1 arrives just a year after the hardware model. With all the talk of the Roland Aira System-1's Plug-Out capabilities, it's easy to forget that this is actually a pretty respectable virtual analogue instrument right out of the gate. And now Roland is giving in-the-box producers a chance to get their hands on it with the release of a software version. This VST and AU plugin looks to mirror the hardware pretty closely. If features two oscillators (and 12 oscillator types), plus an arpeggiator with Scatter function. If you already own the System-1 or new System-1m hardware, the software works as a patch editor/librarian, with the physical unit serving as a one-to-one controller. Find out more below or on the Roland website. The System-1 soft synth is available now for the 'campaign price' of $145/€110 (regular price is $195/€145), while existing System-1/System-1m owners can have it for a campaign price of $95/€75 (regular price is $145/€110). 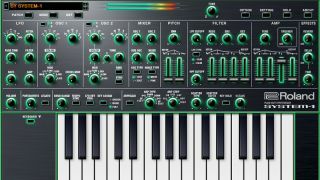 Roland has also announced that the SH-101 Plug-Out synth - which was previously available exclusively to System-1 owners - has also been released as a VST/AU plugin. This costs $145/€110.